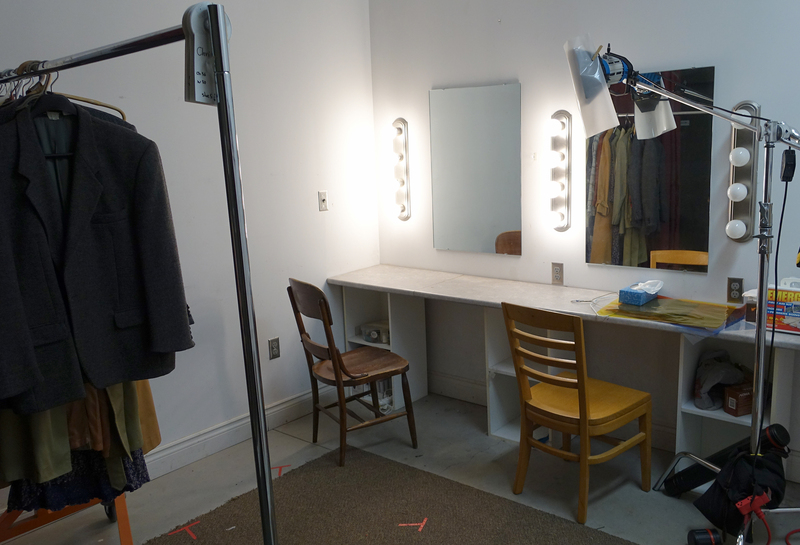 Anyone who has worked with Domino Theatre in Kingston, Ontario is familiar with the practical but rather stark actors’ dressing room. White plaster walls, big mirrors, lights and a floating rack of costumes for whatever production is in the works. Last weekend the crew of Fault were challenged with turning that little room into a location for their movie, presumably a dressing room in the rural “Barn Theatre” where some of the movie action occurs. Last year, scenes on the stage of the “Barn” theatre, in the lobby and lounge and outside the theatre were filmed. An additional pick up scene was required to finish the film and the original location was not available. Fault‘s producer, Barbara Bell, coaxed her Kingston theatre friends to let Fault use the Domino dressing room for this scene. The crew arrived at Domino around 6 pm after a day shooting outdoors and started to scrounge for set pieces to give the place more character. Director Leigh Ann Bellamy contemplating how to dress this set. Now, if you are going to look to dress a set, the best place to be is in a theatre. Soon the small crew came up with pieces of wall and drapes and lights and set pieces that turned one corner of the DominoTheatre dressing room into a wonderfully warm set, rich with great character. The scene, with Jennifer Verardi and Amelia MacKenzie-Gray-Hyre and directed by Leigh Ann Bellamy was shot from several angles, including one from between the costumes on the rack. By 11 pm it was a wrap, the props and set dressing all returned to various cubby holes in the Domino Theatre and the crew on thier way home, anticipating one more day if shooting before the movie was in the can and ready for all the work of post production. In the past year or two I have had the pleasure of working, in varying capacities, with friends who were shooting movies in Kingston and in Kenya. I worked with “director greats” McGuire, Hincer, Nielson and Bellamy and was even a background performer (along with 200 other Kingstonians) in the major studio Guillermo del Toro film, Crimson Peak, shot in Kingston market square in April. It has been fascinating to participate in this process and given me great appreciation for all the work and planning that goes into even few seconds of motion picture. Here are some glimpses of what you might eventually see and what it took to make that magic happen in Fault. Watch for it. Leigh Ann Bellamy and Director of Photography, Christian Paulo Malo, contemplate a camera angle. Daniel Karan is boom operator. 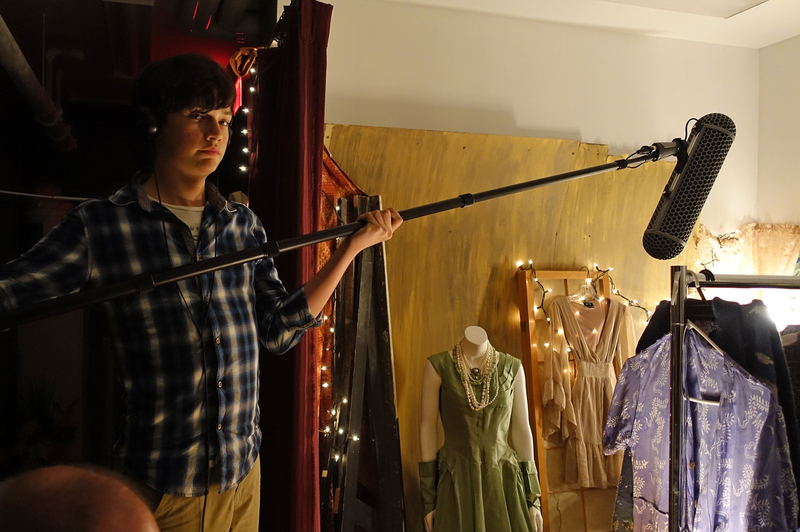 Sound is captured with lavaliere microphones hidden in the actor’s costume and an overhead boom. Jennifer’s microphone was in a box of Kleenex on the counter. Here is what you will see in the movie , or close to it. A far cry from the bare Domino dressing room. 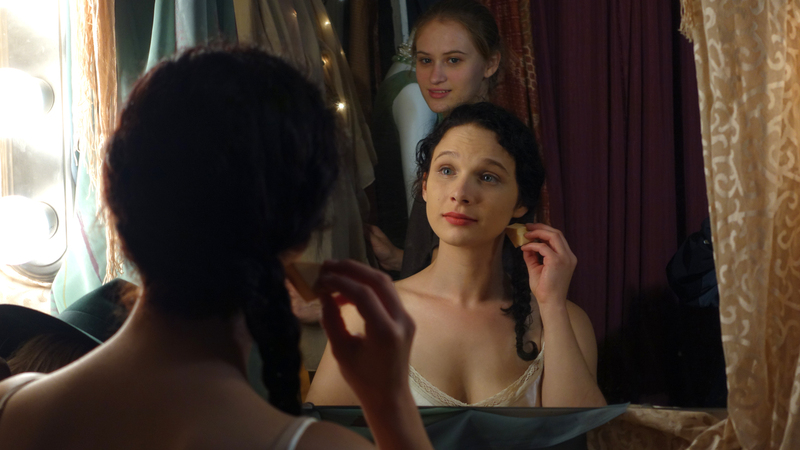 Jennifer Verardi and Amelia MacKenzie-Gray-Hyre in a scene from Fault. When you see two characters quietly talking in a movie scene there is a whole crew only inches away making that happen. This entry was posted in Uncategorized and tagged Amelia MacKenzie, Bellamy, Domino, Domino Theatre, Dressing room, Fault, Jennifer Verardi, Kingston, Location, Movie, Ontario, Set, Set dressing by johnageddes. Bookmark the permalink.